Most of the following examples were contributed by users who have used NCL to create some truly unique and nice looking visualizations. This page is mainly for showing off some of those visualizations. unique_2.ncl: A stick plot created by calling gsn_vector and by setting the resource vcMapDirection = False, which allow the vectors to be in their own reference frame. This script was written by Matt Stumbaugh of NOAA. unique_3.ncl: A lengthy script that draws three different plots on the top half of the page. 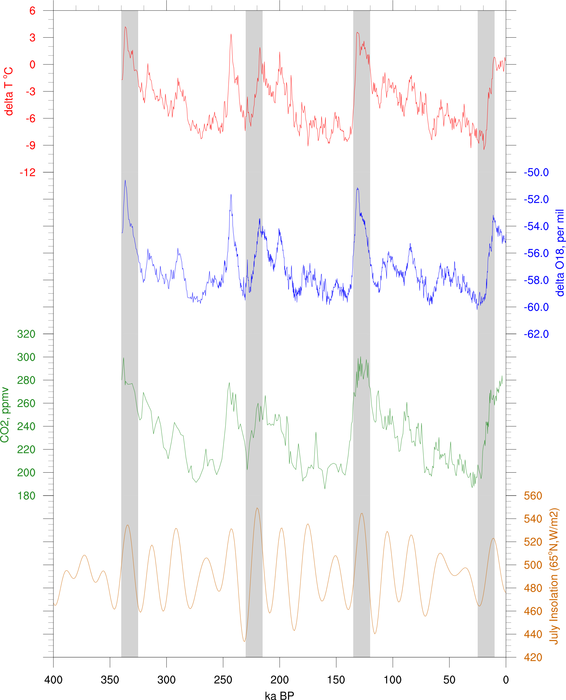 Five different colormaps are used on one page by drawing each individual plot before the next plot is created. This is done by setting gsnDraw = True (which is the default) or by calling draw before the next plot is created. To avoid advancing the frame, gsnFrame is set to False; the frame is advanced at the end of the script by calling frame. 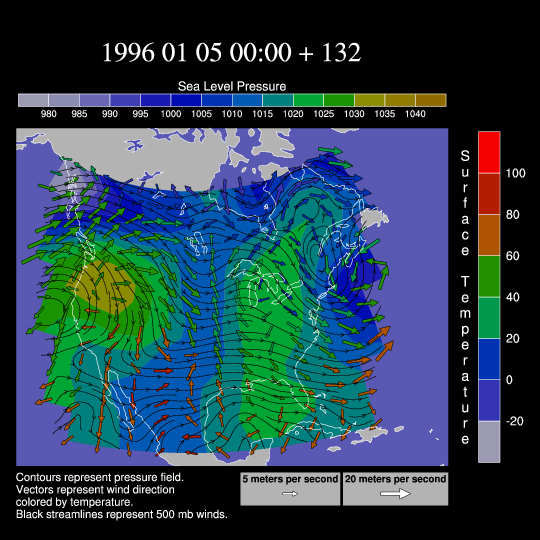 unique_4.ncl: This script creates an animation of the January 1996 snow storm. Wind vectors are colored by temperature and overlaid on a map along with a 500 mb streamline plot and a color-filled pressure field contour plot. Only three of the frames are shown here. Click here for an animation. See example 7 on the "New Color Capabilities" page to see this same example drawn using the new transparency capabilities added in V6.1.0. 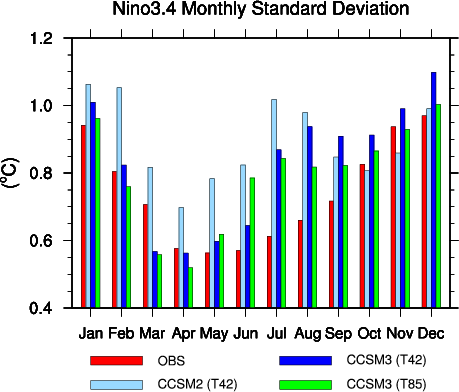 unique_5.ncl: This script creates a bar chart denoting monthly standard deviation values for 4 different timeseries. The legend is created by using gsn_legend_ndc. See example 11 on the bar chart applications page for an example of paneling this kind of plot. unique_6.ncl: This script creates a panel plot with ten XY plots and a legend at the bottom. 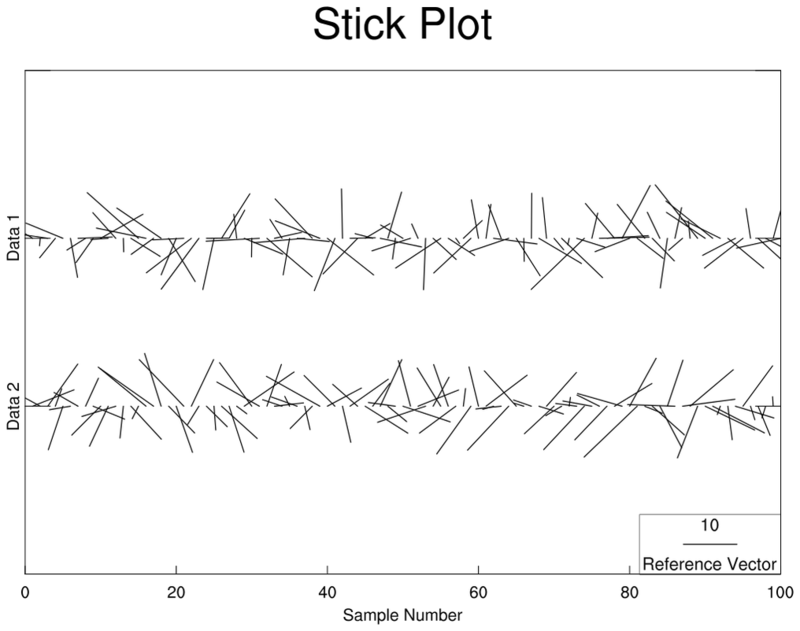 Each XY plot in the panel is an overlay of three plots with a combination of solid lines, dashed lines, and markers. The overlay function is used to do the overlays, and the functions gsn_text_ndc, gsn_add_polymarker, and gsn_legend_ndc are used to annotate the figure. unique_7.ncl (script not available yet): This animation, sent to us by Dr. Ram Nair of SCD/NCAR, is a simulation of an idealized vortex evolution on the sphere. He presented the result at an international seminar PDEs on Sphere 2006. This is a test-case for advection/transport problem on the sphere. 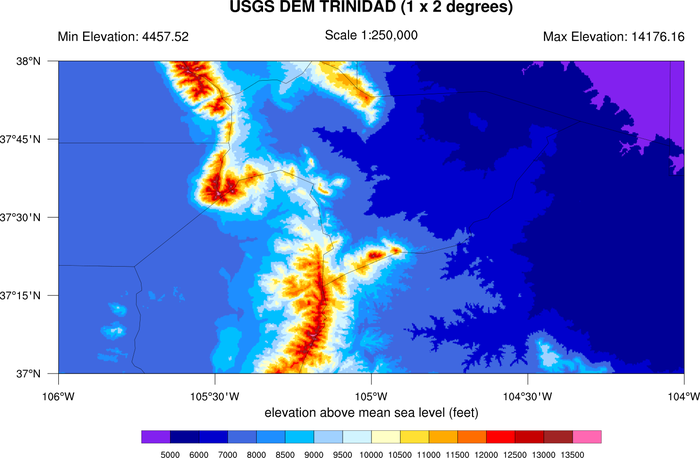 unique_8.ncl: This script creates a contour plot of sea surface temperature and overlays a storm track for Hurricane Katrina. 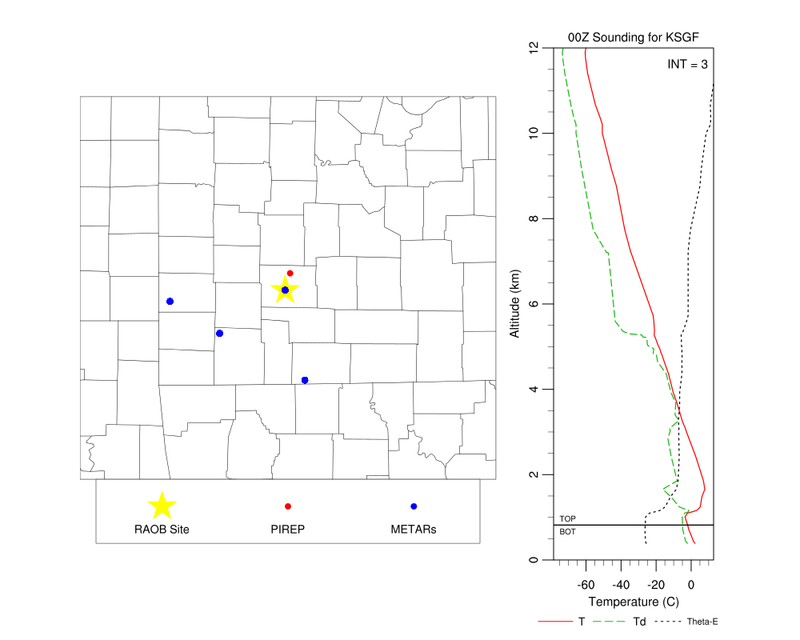 It was contributed by Kimberly Trent (a 2006 SOARS student of NCAR/UCAR), with help from Adam Phillips and Mary Haley, also of NCAR. 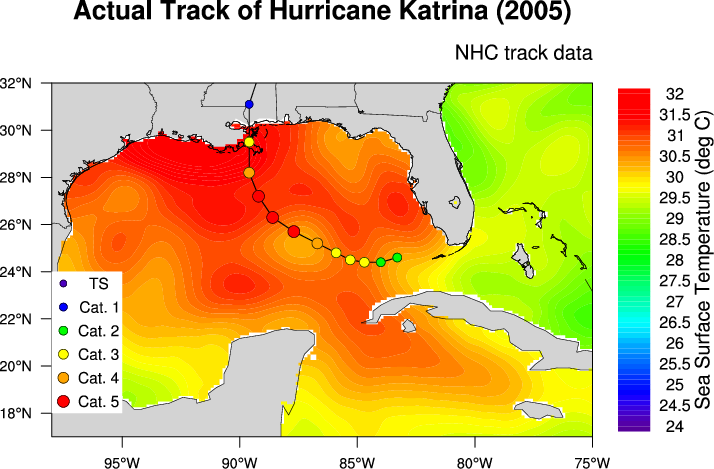 The track data came from NHC reports from the document "Tropical Cyclone Report Hurricane Katrina" (Richard D. Knabb, Jamie R. Rhome, and Daniel P. Brown). The SST field was obtained from NCEP. 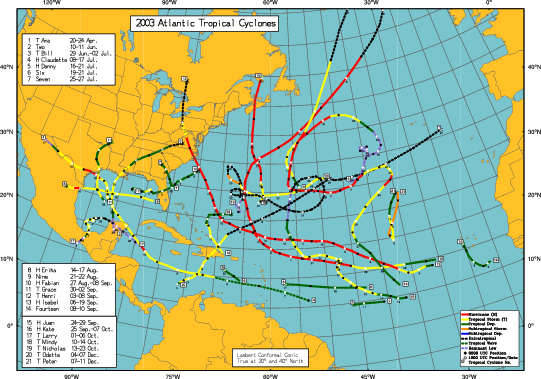 The storm track is done using filled and hollow circles, and polylines. The circles are created using the NhlNewMarker function. A legend is created using calls to gsn_text and gsn_polymarker. unique_9.ncl: This script shows how to create a topographic map using a raster contour graphic colored by elevation. This example is also available as a Python script using PyNGL to generate the graphics and PyNIO to read the data from a netCDF file. See the PyNGL gallery for a pointer to the script. This example was written by Mark Stevens of NCAR. unique_10.ncl / unique_10_thicker.ncl: This script shows how to create a series of XY plots attached along the X axes, with gray-filled bars added for emphasis. The second image is identical, except with thicker plot elements for a nicer looking image. It was created by "unique_10_thicker.ncl". 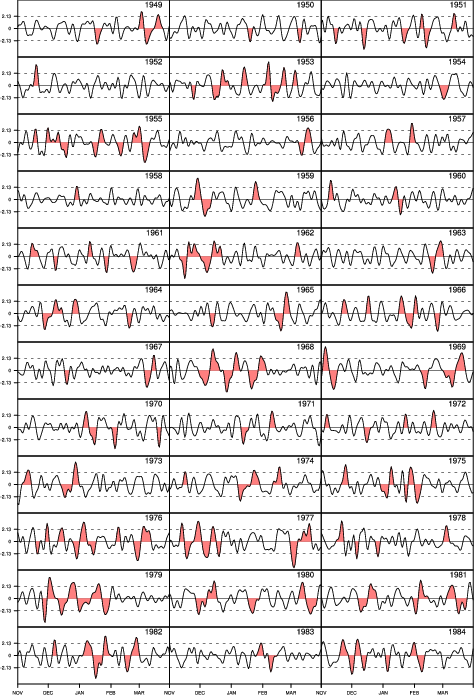 This is a typical plot that people see in papers of paleoclimate studies. unique_11.ncl: This script shows how to create a series of XY plots attached along the X and Y axes, with specific areas filled for emphasis. This script plots daily index highlighted with polygons year by year. 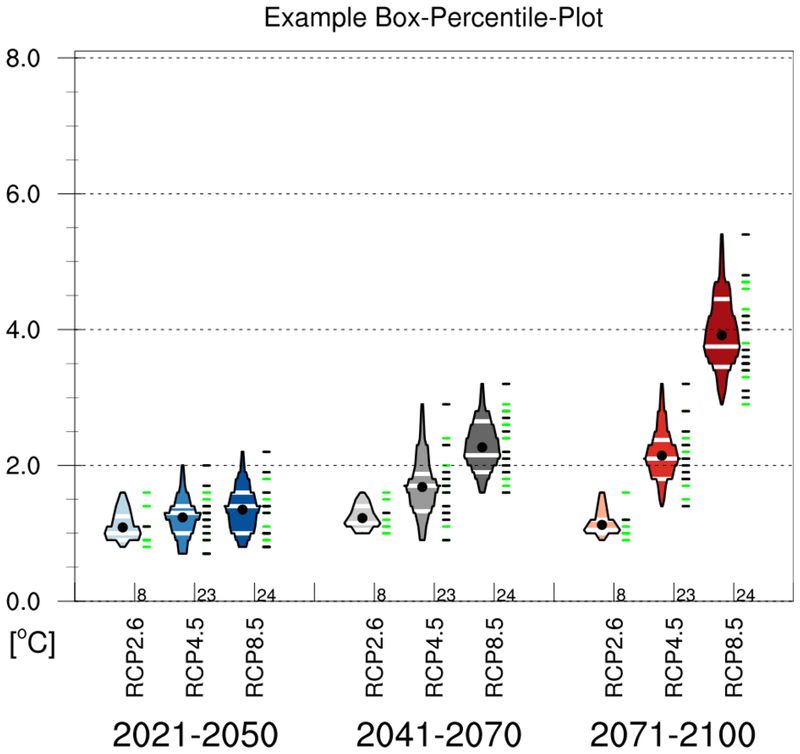 This is a typical plot that people see in papers of climate studies. The plots are paneled using gsn_panel. 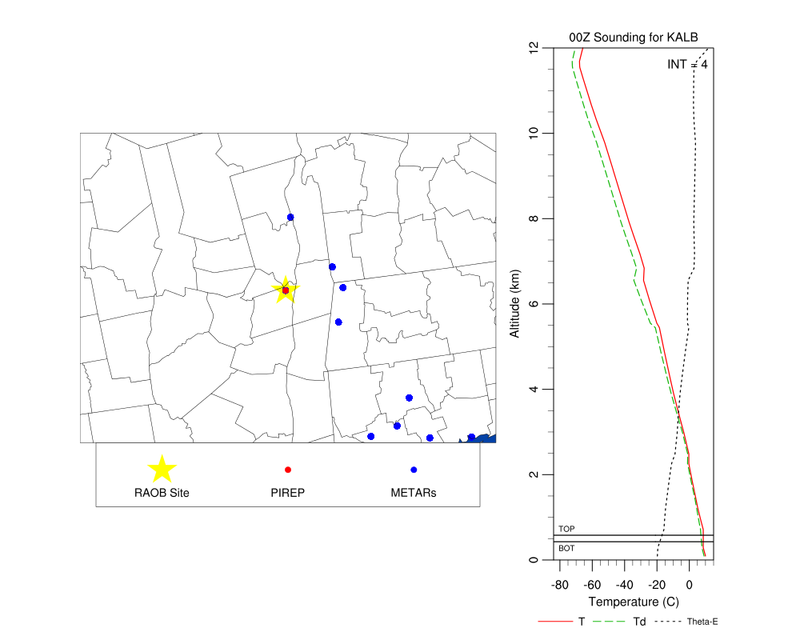 Because they are different sizes, it was necessary to set gsnPanelScalePlotIndex to 1 (the top middle plot), indicating that this plot should be used to determine the scale factor for resizing all the plots. Otherwise, you will be unable to see the X axis labels on the bottom three plots. This example was contributed by Dr. Xiaofeng Li, of IAP/CAS. 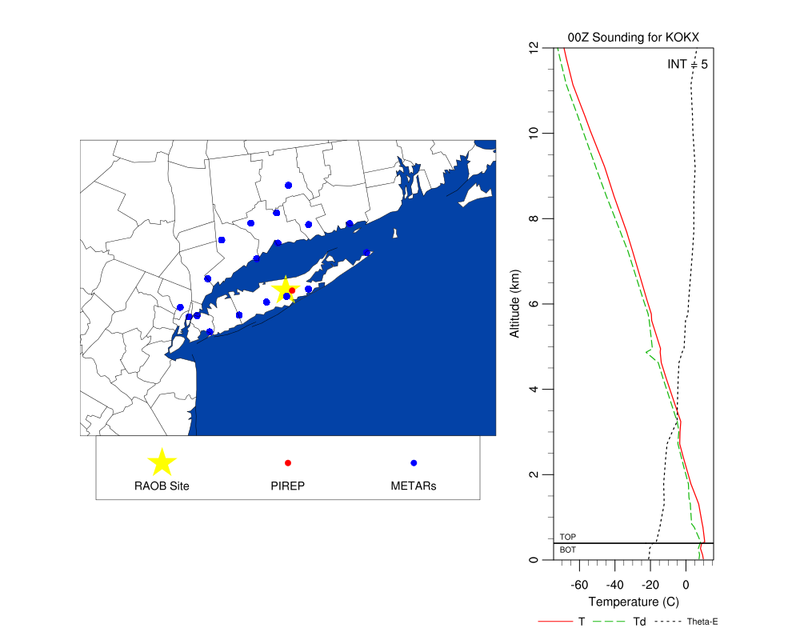 unique_12.ncl: This script shows how to plot a map with PIREP/METAR/RAOB locations and a profile of the sounding next to the map all on the same image. 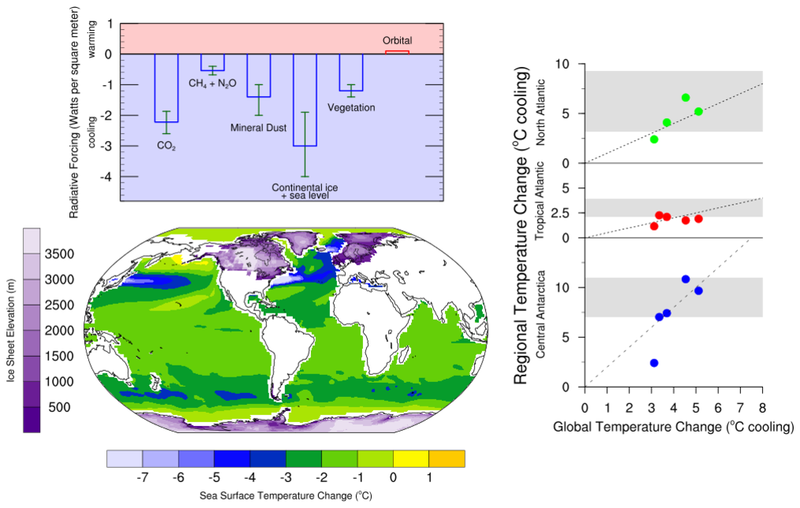 It was contributed by Daniel Adriaansen of NCAR/RAL. 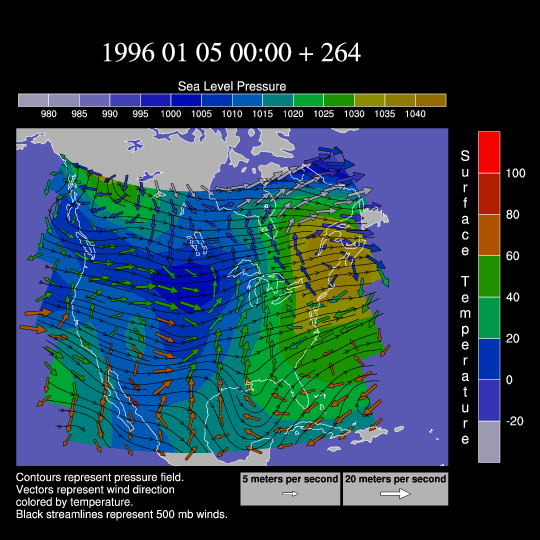 The script was developed to visualize the sounding taken when there was a pilot report (PIREP) of icing made within a certain distance of the sounding location. 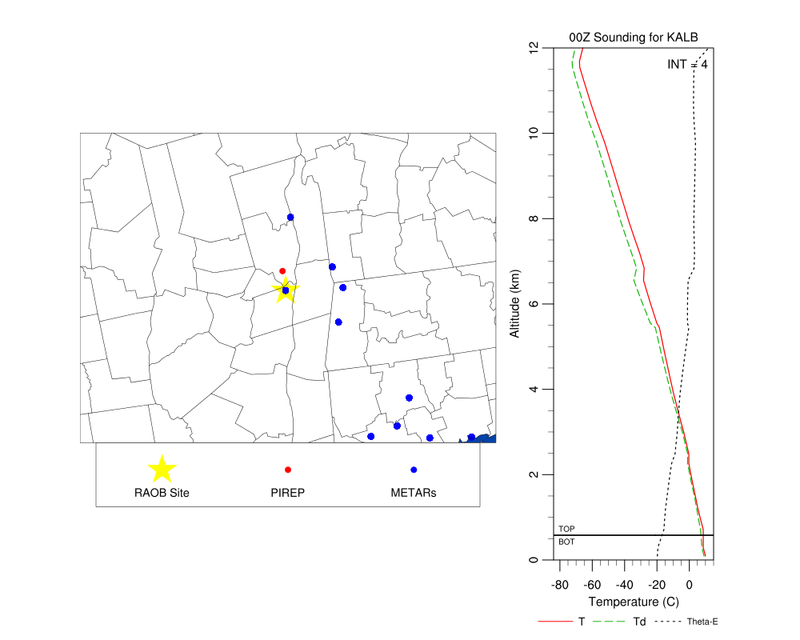 Additional METAR data were identified as well and the locations of those sites (within a prescribed distance around the sounding location) were added to the map. Information about the icing in the PIREP such as the layer top and bottom (when available) and the intensity of the icing were added to the sounding to provide a quick look of what the layer of interest looked like. 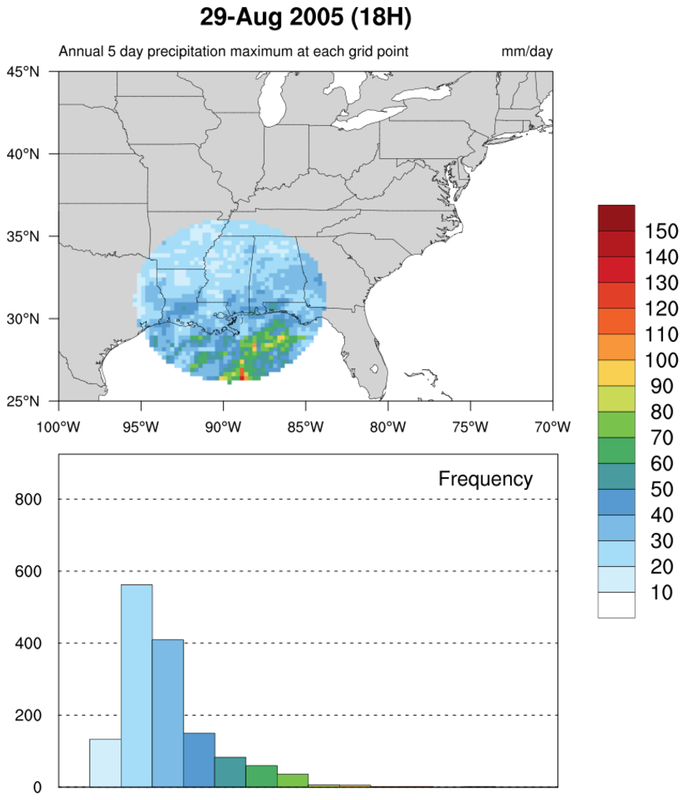 This way, for any day data were available a user would have a quick-look plot consisting of a map with the sounding, METAR, and PIREP location with a plot of the sounding and theta-E, and information about the PIREP overlaid. unique_13.ncl: This script shows how to plot multiple time series plots inside a larger time series plot. 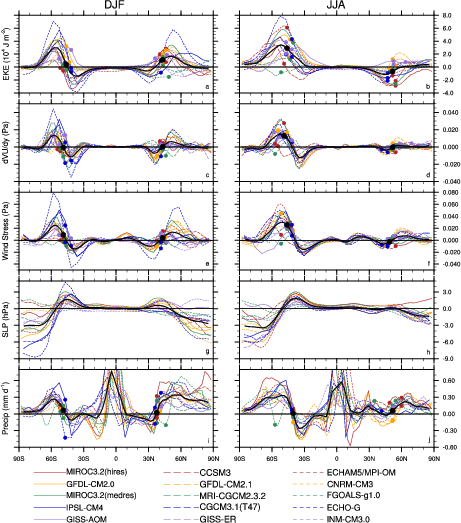 It was contributed by Hongmei Li of Max Planck Institute for Meteorology in Hamburg. 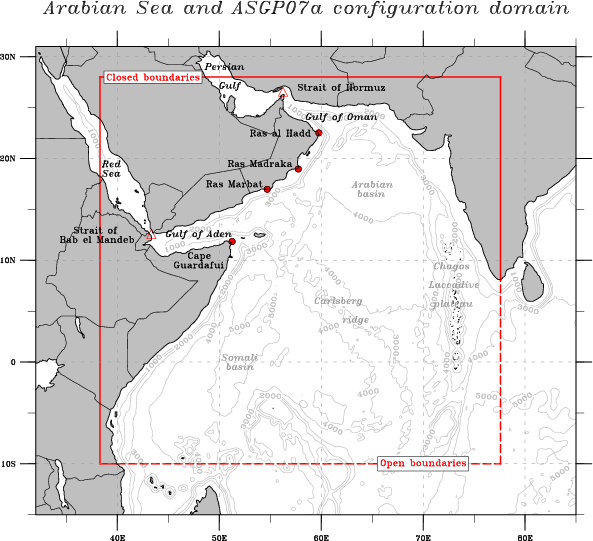 arabian_sea.ncl: This script shows how to draw the Arabian Sea with bathymetric features, ridges and basins, geopolitical boundaries, seas and gulfs, and straits and capes. This is known as a schematic map. unique_14.ncl: This script shows how to nicely overlay quiver and filled contour plots, and how to stipple non-significant areas. 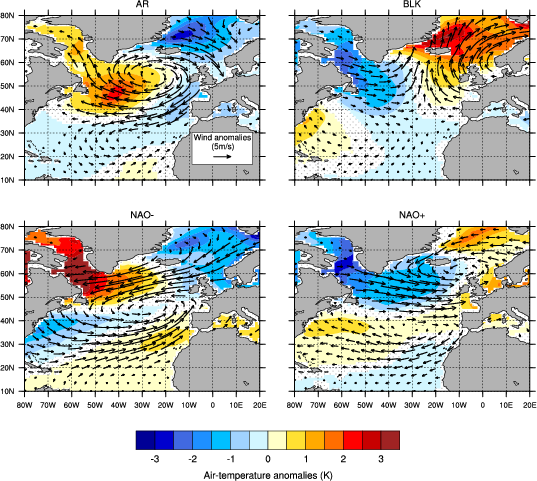 The figure shows the air-temperature/wind anomalies composites for the so-called winter weather regimes. The significance of the composites was computed using the NCL function ttest. Non-significant air-temperature have been stippled while non-significant wind arrows have been dismissed. 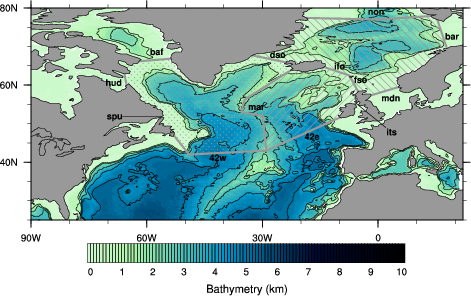 plot_bathy.ncl: This script draws the bathymetry of an ocean model (in kilometers). The colorbar has been imported from Python. We overlay on top of the rasterfill contours line contours that correspond to integer values (0, 1, 2,... 10 km). We also add lines (gsn_add_polyline) that correspond to the default North Atlantic Section of the PAGO tool (http://www.whoi.edu/science/PO/pago/output.html). The sections encompass three different domains that are emphasized by hatched polygons (gsn_add_polygon). Finally, the names of the sections are added (gsn_add_text). compare_wind_fields.ncl: This script compares two wind fields (in this case, to evaluate the impact of the wind forcing on a model). 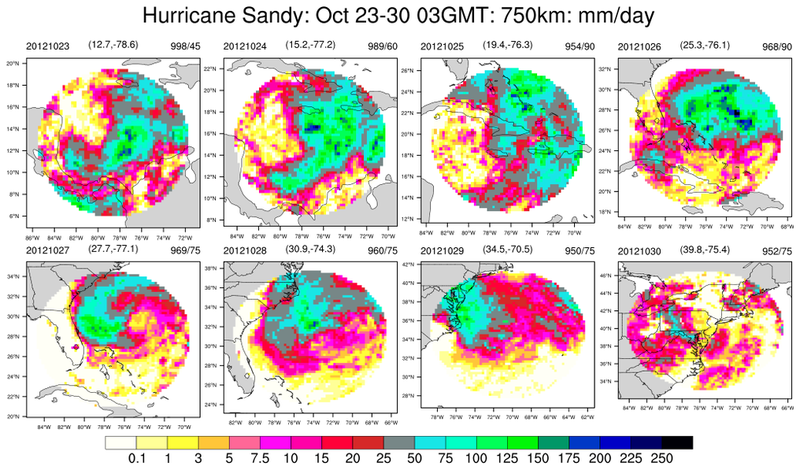 The two wind fields are QuickSCOW (climatology based on QuiskSCAT), and COADS (Comprehensive Ocean Atm DataSet) and they are both interpolated on the same model grid. In order to better catch the differences between the two fields, we draw not only the wind stress but also the wind curl, which is of dramatic importance in the Sverdrup response of the ocean. This requires having two separate labelbars because of the different units and ranges. mkZmean.ncl: This script creates a panel of four XY plots, with filled curves and a custom legend added to the bottom right plot. 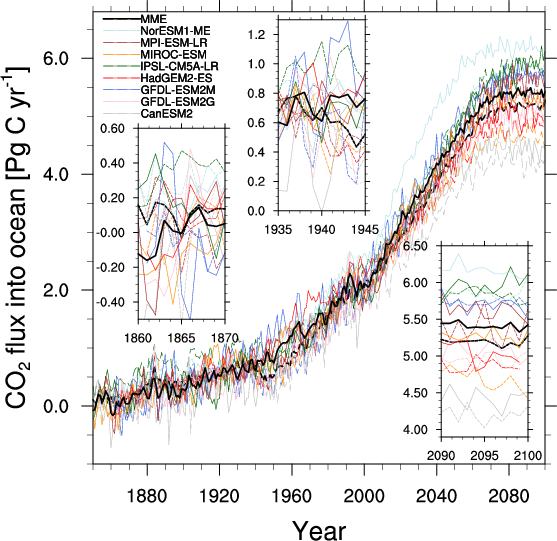 It was contributed by Dustin Swales, an associate scientist at NOAA/PSD. box_8.ncl: This example shows how to create a box percentile plot, which is based on Esty WW, Banfield J: The box-percentile plot. J Statistical Software 8 No. 17, 2003. (http://www.jstatsoft.org/v08/i17). You must download the box_percentile_plot.ncl script in order to run this example. This code was contributed by Frank Kreienkamp of DWD, which is based on code contributed by Carl Schreck and Adam Phillips. 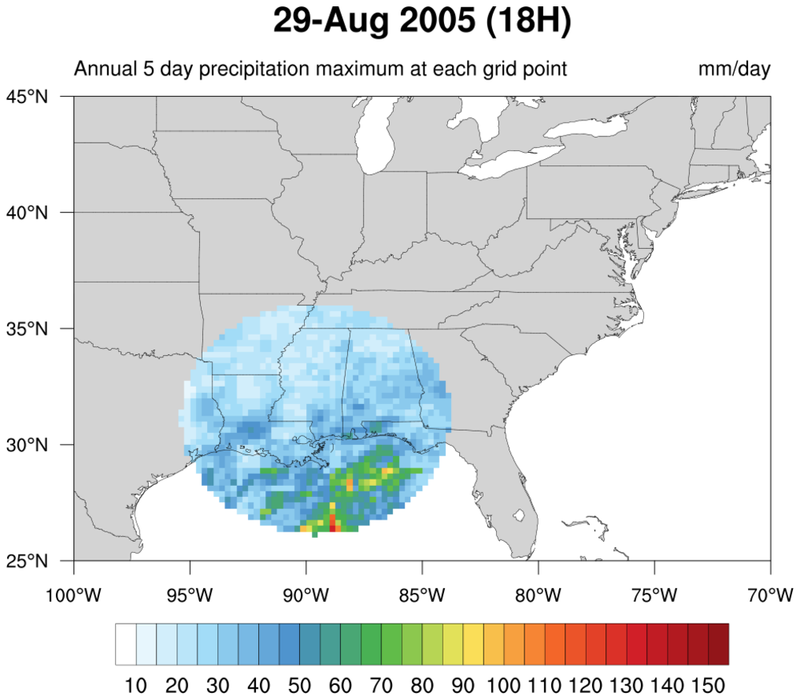 Katrina_circle.ncl / Katrina_circle_hist.ncl: The first script plots the 5-day running average of precipitation for an entire year (2005). 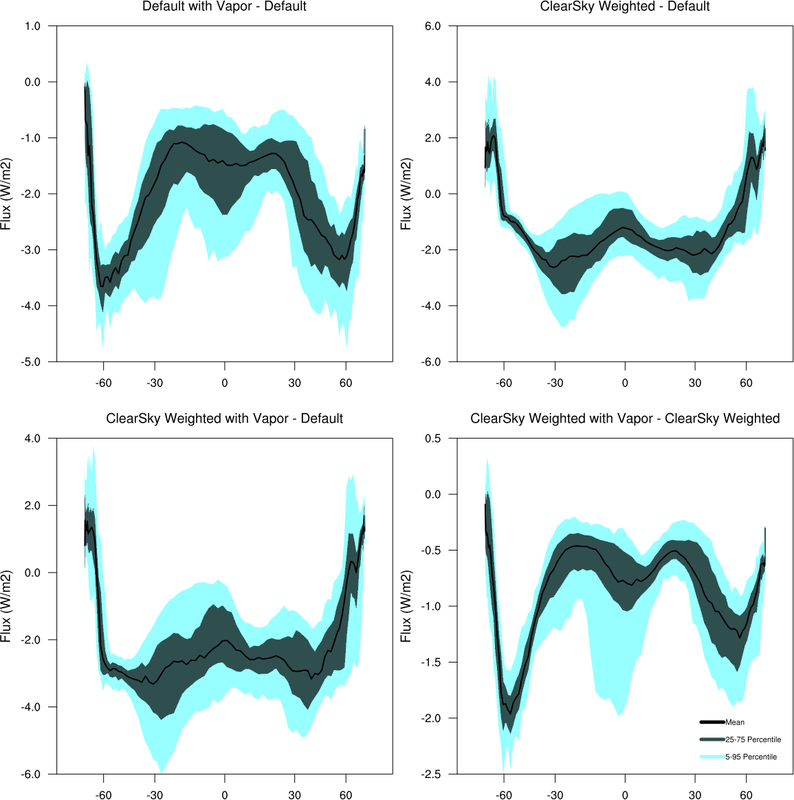 The second script plots the same contour plot, but with a histogram showing the distribution of values for each contour level. This can be a useful debugging tool. Both scripts show a unique way of displaying filled contours, by using nggcog in conjunction with gc_inout to mask data inside a great circle. The still images shown are from one of the time steps. An animation across all time steps for both the contour plot and the contour plot with the histogram was created using ImageMagick's "convert" utility. 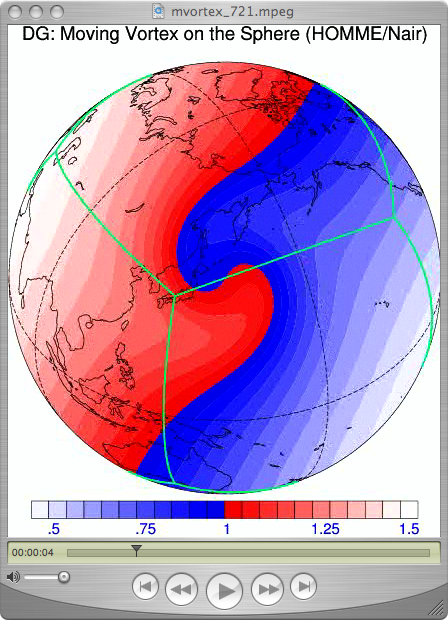 The contour plot code was contributed by Jake Huff, a Masters student in the Climate Extremes Modeling Group at Stony Brook University. 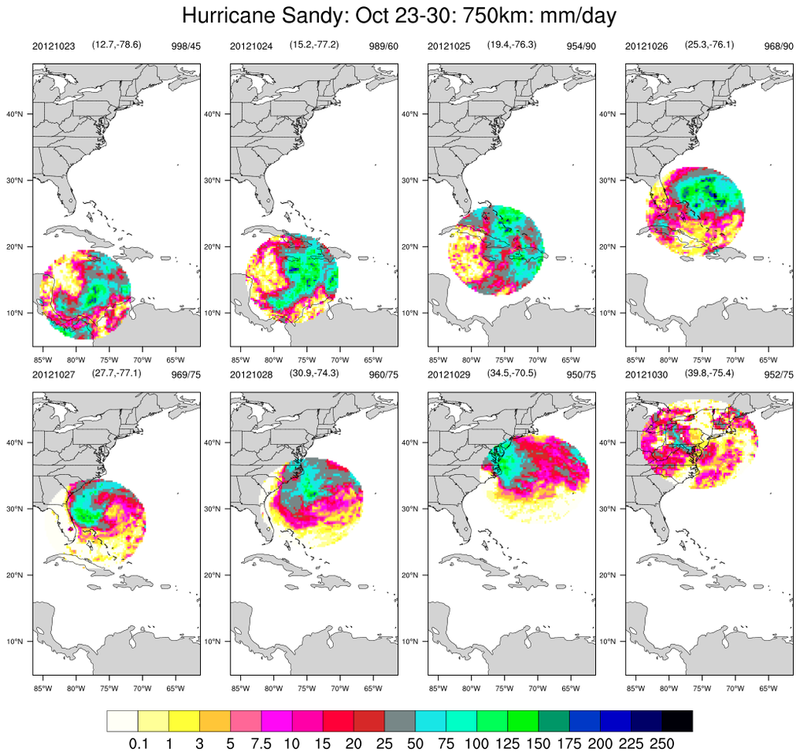 polyg_30.ncl: Use Hurricane Sandy locations at 0300GMT on 8 days (23-30 October 2012). Create areas spanning 750km on each day and plot the total daily precipitation for each day. 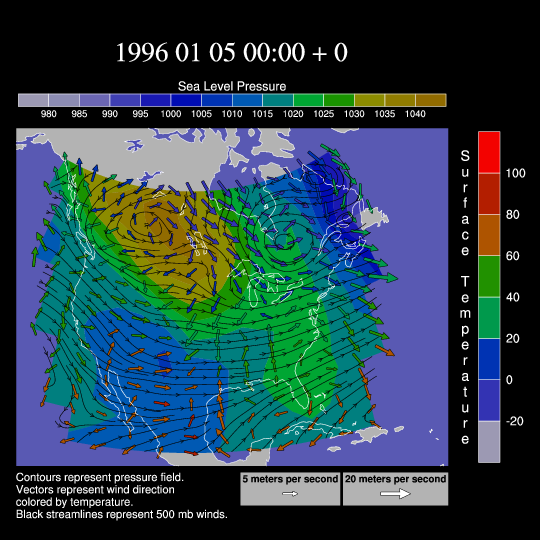 The title indicate the date, the central location and the central pressure and maximum wind speed (mph). The background map is consistent with all the plots. polyg_31.ncl: Similar to polyg_30 except the background map is allowed to change with each storm location.